Only use ginger in your occasional marinade? You’re missing out. Not only is this root delectable, it offers a ton of health benefits. To look at this somewhat funny-looking, knobby little root, it’s not exactly the prettiest ingredient. But ginger is not only delicious, it comes with a wealth of health benefits. Read on for just a few highlights of what ginger offers. Ginger is high in potassium and manganese. It also contains silicon and is a source of vitamins A, C, E, B-complex, magnesium, phosphorus, sodium, iron, zinc, calcium and beta-carotene. Ginger contains powerful anti-inflammatory compounds called gingerols (which are related to capsaicin, the compound from chili peppers). Gingerols are beneficial because they help relax the muscles of the gastrointestinal tract. This is why ginger ale is often used when feeling nauseous or when you have an upset stomach — it helps prevent gas and bloating. Who likes being under the weather? No one. Boost your immune system naturally by consuming more ginger. Ginger is antimicrobial (which means that it kills bacteria internally). It can also be used topically as an antiseptic. Be sure to stock up and use ginger often during cold and flu season. In addition to gingerol (see above), ginger also contains compounds called shogaol and zingrone, all of which contribute to help reduce inflammation. 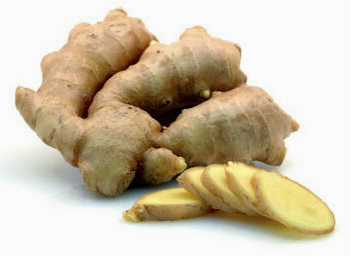 In fact, gingerol in particular has been shown to help reduce the pain associated with osteo and rheumatoid arthritis. Ginger has been shown to reduce the risk of certain cancers by inhibiting the growth and production of cancer cells; for example, killing breast carcinoma cells. Studies have also shown it to be beneficial with regards to ovarian cancer, prostate cancer, gastric cancer and colon cancer. So, as you can see, there are so many reasons you should cook with this tangy root more often. Here are some ideas on how to use ginger more often in the kitchen. Ginger is very popular in Asian cooking, and one of the simplest ways you can use it is in a quick stir-fry, such as in this ginger root and asparagus stir-fry. The sweet yet zesty flavour of ginger makes it a fantastic ingredient to use in baking. This upside-down ginger-pecan peach pie is sure to become a family favourite. The fragrant and spicy characteristics of ginger make it a natural and tasty addition to soup, such as this creamy mushroom and fresh ginger soup.